Cholamandalam MS General Insurance Co. Ltd. is a joint enterprise between the Mitsui Sumitomo Insurance Co. Ltd, Japan and the Murugappa Group. The firm is considered as one of the top insurance firms in India with 109 branches located across the country and more than 9,000 agents offering the best insurance services to people. Claim registration - Call the Chola MS customer care as soon as the mishap happens and register your claim. The customer care executive will guide you through the procedure and give you your claim reference number. Incident survey - Once your claim has been registered, the insurer will send an authorised surveyor to inspect your vehicle and assess the total damage incurred due to a mishap. Get the document copies verified against the originals by the surveyor in order to process your claim. 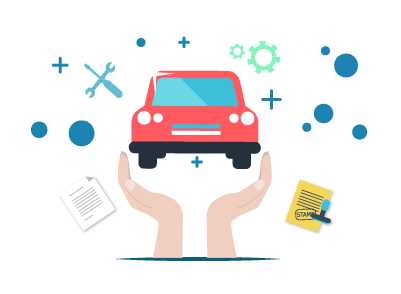 Getting your vehicle repaired - Once the surveyor verifies your documents and assesses the loss, the insurer will approve the repair of your vehicle. Drive your car or get your vehicle towed to the nearest cashless garage in case of a cashless claim or an non-network garage in case of a reimbursement claim, to get your vehicle repaired. Claim settlement - Claim settlement will depend on the type of claim you have registered. In case of a cashless claim, after your vehicle is repaired at the garage, the insurer will directly pay the garage for the repairs made to your car. Post payment, your car will be delivered. In case of a reimbursement claim, after your car has been repaired, you need to pay the garage for the repairs made and collect the invoice and payment receipt for the same. Submit the invoice and payment receipt to the insurer and get the amount you spent on your vehicle repairs reimbursed. In case I sell my car, what options do I have for my car insurance? How can I make changes to my insurance policy in case there are some changes to be made? You can submit a Letter of Endorsement along with the vehicle Registration Copy to the insurer in case you want to incorporate the changes in your insurance policy. How do I add or delete the Hypothecation in my car insurance policy? To add Hypothecation: You have to submit a letter from the bank/an Endorsed RC copy to your insurer. To delete Hypothecation: You have to submit a NOC/an Endorsed RC copy to your insurer. A No Claim Bonus is a discount on the insurance premium rewarded by the insurer to the insured for every claim-free year. IDV is an acronym for Insured's Declared Value and is the present market value of your vehicle which is inclusive of the vehicle and vehicle parts rate of depreciation.